So You Think You Can Dance kicked off its 11th season with auditions in New Orleans and Chicago. It's great to see the show again; I look forward to it every summer! We were joined by host Cat Deeley and regular judges Nigel Lythgoe and Mary Murphy. Wayne Brady was a guest judge in New Orleans, and Jenna Elfman joined as a guest judge in Chicago. I don't know what Wayne Brady's dance background is, but he is charming and entertaining as a judge. Jenna Elfman offered constructive comments and did a fine job as well. The auditions work as they have before: dancers perform before the judges, where they either get a ticket to Hollywood, are sent home, or are sent to choreography to show their partnering skills. Since the auditions are a parade of dancers, I'll comment on some highlights of the show. One of my favorites from last year's auditions, Caleb Brauner (pictured above) returned to try out again. He looks a lot like Chris Colfer from Glee, and I think he is adorable. Since last year, his father, who appeared with him onstage last year, passed away suddenly. Caleb brought his quirky, endearing dance style again this season. In New Orleans his performance was light and he was sent to choreography. He did not do well, and was very upset. He returned in Chicago and tried out with a more personal dance, inspired by his last voicemail from his father. He went back to choreography, showed improvement, and won a coveted ticket to Hollywood. Tanisha Belnap auditioned in New Orleans on her own, although she is a ballroom dancer. She is from a family of 12 children, and works odd jobs to support her dance studies. She was sassy and fun, and got a ticket to Hollywood. 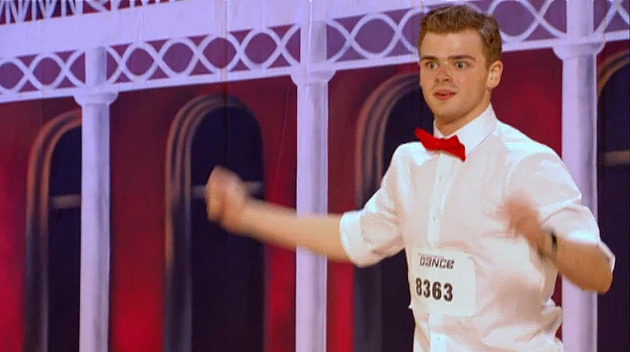 Trevor Bryce did a clever and witty ballet number with some hip hop moves, and also got a ticket to Hollywood. We also met Jacoby Jimmerson, a heavy guy who still has good dance moves, and who teaches Zumba. He did a "dance off" with Wayne Brady that was fun to watch. He did not make it through. Marcquet Hill and Brooklyn Fullmer were two of my favorites. They are friends (not dating, as she mentioned several times) and ballroom dancers. We've seen Marcquet before, when he was just 16 and partnering Witney Carson for her ballroom audition. They went through, and I think they will both be forces to reckon with this season. Two friends from Miami, Nick Garcia and Rudy Abreu, both traveled to Chicago for the auditions. Nick performed a solo ballroom routine (and it was terrific!). Rudy performed a "dance warrior" number that was showy but didn't wow me as much. They both got tickets to Hollywood. A group of four dancers who were almost male strippers performed onstage with Mary Murphy and Jenna Elfman. Not surprisingly, they did not make it through. "Blurred Lines" seems to be the go-to song this year. I lost count how many times it was played. Justin Bieber introduced a dance crew competition. I did my best to ignore his brief segment on the show. Next week's auditions are in Chicago and Los Angeles. Looking forward to them! What did you think of last night's show? Do you have any favorites of the dancers you have seen so far? I would love to read your comments, below. Looking to this season! Personally, I like the dancers like Caleb who may be more amateur, but have more personality, and you get to see them improve over the season. You know, I totally agree. I like to see personality and heart, especially if the dancers grow in skill and technique over the season.